The following is an op-ed piece by FHS staff historian James G. Lewis that appeared in the Asheville Citizen-Times on August 9, 2015, in honor of Gifford Pinchot’s 150th birthday on August 11. Born just after the guns of the Civil War fell silent, he died the year after the first atomic bomb was dropped. He was, in his own words, a “governor every now and then” but a forester all the time. Indeed, Gifford Pinchot, born 150 years ago on Aug. 11, served two terms as Pennsylvania governor but is best known as the first chief of the U.S. Forest Service (established 1905), which today manages 192 million acres. He also created the Society of American Foresters (1900), the organization that oversees his chosen profession, and the Yale School of Forestry and Environmental Studies (1900), the oldest forestry school in America. And just south of Asheville, in the Pisgah National Forest, is the Cradle of Forestry in America, both of which exist in part because of him. But perhaps his greatest legacy is his prescient call, made 75 years ago, for conservation as the foundation for permanent peace. Gifford Pinchot during his tenure as Forest Service chief. When Pinchot enrolled at Yale College in 1885, his father encouraged him to pursue forestry. It was a radical idea. The United States had no forestry school, no working foresters, no land being managed on scientific principles. To become a forester, in 1889 Pinchot traveled to Europe. There he met Sir Dietrich Brandis, who was leading British forestry students on tours of sustainably managed forests in Germany. The best way to introduce forestry to the United States, Brandis told him, was to demonstrate that scientific forest management could earn a private landowner a steady income. Pinchot came home in 1890 full of ideas but few job prospects. Through family connections, he learned of George Vanderbilt’s great undertaking in Asheville. Vanderbilt hired him to be his estate’s—and thus the nation’s—first working forester. When some of Pinchot’s employees began asking why he did things a certain way, like selecting only some trees to cut instead of cutting them all, he decided to teach them in the evenings. Pinchot didn’t have the temperament to be a teacher, and the classes, such as they were, didn’t last. 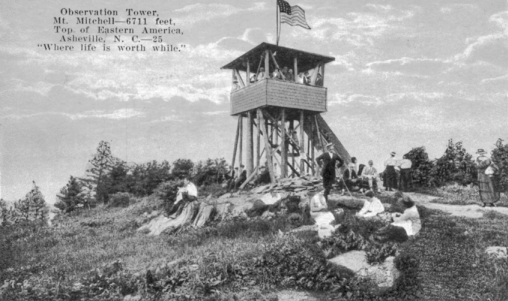 But fortunately for America, his forestry exhibit at the Columbian Exposition of 1893 and accompanying booklet, Biltmore Forest, attracted wider attention, and he left Biltmore in 1895. On his recommendation, Vanderbilt hired Carl Alwin Schenck, another Brandis protégé, who in 1898 established the Biltmore Forest School, the first forestry school in America. In 1898, Pinchot was appointed chief of what would become the U.S. Forest Service. He and his friend President Theodore Roosevelt made forestry the focus of a national conservation movement. The two held national and North American conservation conferences before Roosevelt left office in 1909. An international one was scuttled after Pinchot was fired by President Taft in 1910. A political progressive, Pinchot next plunged into politics. No matter what office he ran for—governor, senator, representative—he advocated for human rights and sustainably managed natural resources. In the 1930s, he watched as Europe and Asia waged wars in large part over access to natural resources. His 1940 observation that “international co-operation in conserving, utilizing, and distributing natural resources to the mutual advantage of all nations might well remove one of the most dangerous of all obstacles to a just and permanent world peace” rings louder even today and is a premise of the just-released UN Sustainable Development Goals. Although planting a tree or visiting the Cradle of Forestry are good ways to commemorate Gifford Pinchot’s 150th birthday on Aug. 11, the best way to honor America’s first forester is to continue working for conservation and, by extension, world peace. James Lewis is the staff historian at the Forest History Society in Durham and an executive producer of “First in Forestry: Carl Schenck and the Biltmore Forest School.” The film will have its world premiere at Brevard College on Aug. 30 and its television premiere on UNC-TV in 2016. “How could we lose this forest?” It’s a history mystery we’d been working on for more than two weeks when Molly Tartt, a member of the Daughters of the American Revolution in western North Carolina, asked me that in an email. Indeed, how does a 50-acre forest vanish from maps and memory? No one knows where the forest is today, and few have heard of it. It’s more legend than fact at this point, it seems. Molly had been searching for some time and turned to FHS for help, fittingly, just before Independence Day. A December 1939 newspaper article trumpeted the DAR’s plans for planting a forest to “memorialize the North Carolina patriots who took part in the struggle for independence.” An area that had been heavily logged and burned over would be reforested. The plan called for 60,000 trees to be planted on 25 to 40 acres set aside for the memorial (we believe it to actually be about 50 acres) in an area between Devil’s Courthouse and Mount Hardy Gap. The United Daughters of the Confederacy (UDC) announced at around the same time that they intended to plant 125,000 red spruce and balsam trees nearby to commemorate each North Carolina man who served in the Confederate Army. Today there is a wooden sign for that forest at the Mount Hardy overlook. The DAR memorial forest project was part of a national conservation campaign by the organization leading up to its golden jubilee in 1941. The nation was facing the twin crises of economic depression and ecological disaster. It may have been the Dust Bowl years on the Great Plains, but in the Appalachian Mountains, forests and watersheds were suffering too. Though the land was within the Pisgah National Forest, logging companies had contracts to cut and proceeded to do so via railroad logging. 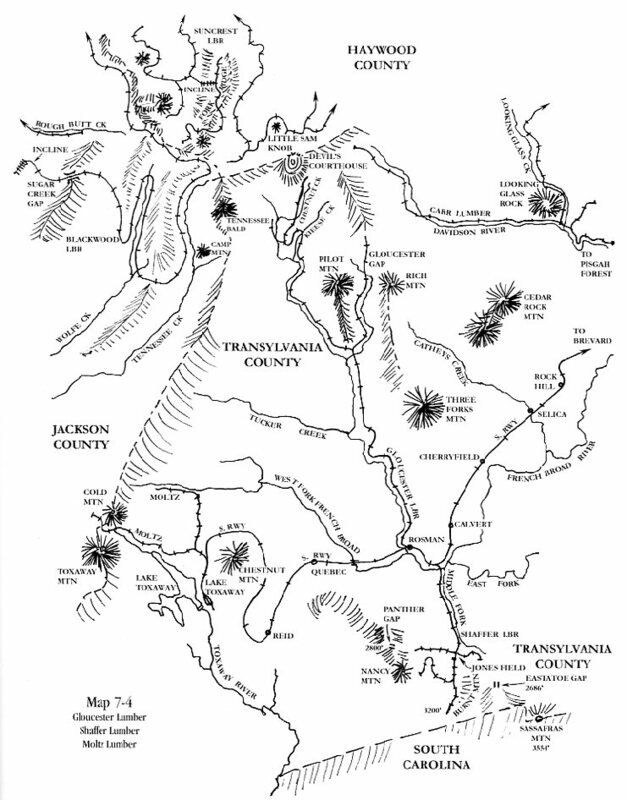 The rail lines extended deep into the mountains, with the labor of men and machines combining to take a toll on the Southern Appalachian forests. In 1939, the President General, Mrs. Henry M. Robert, chose the Penny Pine program as one of her Golden Jubilee National Projects. Each state was to have a memorial forest, beginning in 1939 and culminating in 1941 on the NSDAR 50th Anniversary. Each chapter across the country was to pledge, at the very least, one acre of pine seedlings. Five dollars an acre at a penny each equaled 500 trees. The Civilian Conservation Corp (CCC), under the supervision of the U.S. Forestry [sic] Service, would do the actual work of planting and care. By then, forest conservation leaders in North Carolina had been agitating for nearly two decades for state and federal protection of forests and watersheds. They formed the state’s forestry association in 1911, and its forest service in 1915. And although the Weeks Act of 1911 had led to the creation of the Pisgah National Forest in 1916, where the proposed memorial forest would be located, federal management didn’t immediately translate into better environmental conditions. Logging companies carried out their existing contracts and logged what they could—in this case taking “one of the best virgin stands of spruce in the United States,” according to a 1941 newspaper report, and leaving “only a few scattered trees of merchantable species due to clearcutting” and fire—before turning over land to the Forest Service. In the late 1930s the conservation (and patriotic) ethos of the local and state DAR chapters was strong and members were highly motivated to take action on many fronts. This can be seen through reports about the state chapter in the annual national congress proceedings, beginning the same year President General Robert announced the golden jubilee project. On May 15, 1940, six months after announcing the planting project, state and national DAR leaders drove out a winding mountain road from Waynesville to the Pisgah National Forest for the dedication ceremony along the Blue Ridge Parkway, then under construction. Mrs. Robert traveled from her home in Maryland to accept the forest on behalf of the national organization, and Mrs. McAllister presided over the proceedings. The only man invited to participate in the program was the U.S. Forest Service’s H. B. Bosworth, Pisgah National Forest’s supervisor, who briefly explained the federal government’s reforestation projects on that windy day. You can see the ladies trying to keep their hats on in the few remaining photos. Pisgah Forest Supervisor H.B. Bosworth addresses the gathering. The women aren’t saluting; they’re holding on to their hats. The site was to be marked with a bronze tablet mounted on a large boulder, like in the second photograph down below, and placed at a parking area adjacent to the forest. We don’t know where the above photo is taken, or what road that is above them (or if it’s even a road). A photo from the ceremony (below) shows a sign attached to two poles. We don’t know if the sign is bronze or wood, or if a tablet attached to a rock was ever installed. (Demand for bronze after U.S. entry into World War II meant postponing the casting of the UDC tablet, whose ceremony was two years later, until after the war.) The reforestation effort didn’t begin until 1941, when the seedlings were mature enough to plant. This is the only photo we have seen showing the sign. We’ve recently learned the poles were made of brass. It’s not known when the forest went “missing.” I’ve found only a single mention of the DAR forest after 1942; it was in a 1951 newspaper column “Looking Back Over the Years” that recapped news from ten years before, and it was about planting the seedlings. The UDC forest planted was “misplaced” for a few decades but was relocated and rededicated in 2002. 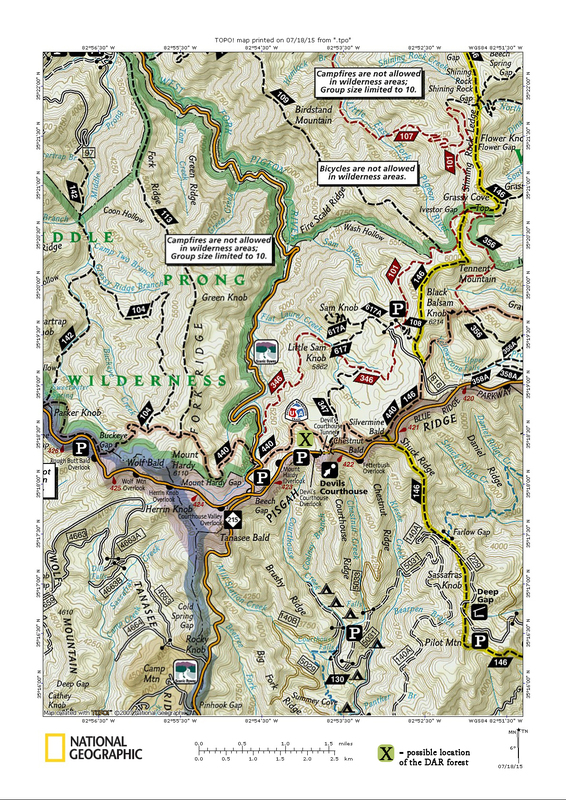 Research conducted here at FHS and in western North Carolina has narrowed the DAR forest to being around the Devil’s Courthouse overlook at mile marker 422, on the north side (see map). It’s rather ironic that alongside the newspaper article in the April 24, 1941, announcing the arrival of the spruce seedlings for planting is one about the romantic comedy film opening in town that weekend. The now-forgotten film The Man Who Lost Himself centers around a case of mistaken identity and redemption that of course ends happily. If you know anything about this forest that was lost and possibly mistaken for another, please email me at James.Lewis AT foresthistory.org. We’d like to identify this forest and write a happy ending for this story, too. “X” marks the possible location of the DAR forest. Click on the map to enlarge. Since the original post went up, we received the map below courtesy of Molly Tartt. She received the copy from a former Forest Service employee. The map is dated three days before the newspaper article mentioned above that the seedlings had arrived. US Forest Service map of the area showing the two memorial plantations, dated April 21, 1941. Click the map to see it enlarged. The chain-like symbol with the line through the links represents the county line and the same symbol without the line is either a road or a trail. Close-up of the area from the same map. The parkway runs on the south side of both forests. 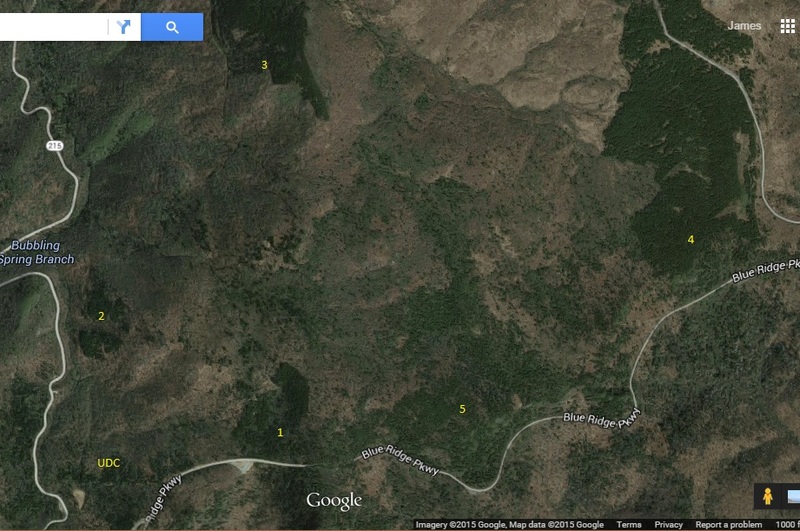 This satellite photo indicates where the forest is located today (1). It’s curious that there are other clusters of what appear to be similar species in the vicinity, as indicated by numbers 2-5. It’s not known if these were planted or naturally regenerated. A re-dedication ceremony was held on October 14, 2016, during which a new sign commemorating the original dedication and explaining the impact of logging on the area was unveiled. The ceremony attracted about 200 people, including the national leadership of the DAR, and was covered by local newspapers the Transylvania Times and the Smoky Mountain News. The new sign, with the DAR forest in the background. Blue Ridge Parkway Superintendent Mark Woods addresses the crowd during the ceremony. Lorie Stroup, acting district ranger for the Pisgah National Forest, spoke on behalf of the U.S. Forest Service. The DAR Jubilee Forest, as seen from Devil’s Courthouse, Oct. 14, 2016. Many thanks to Molly Tartt and to the researchers and historians at the DAR library in Washington, DC, for their help and to all who provided photos and other sources. Carolyn Merchant, “Women of the Progressive Conservation Movement: 1900-1916,” Environmental Review Vol. 8, No. 1: 68-69. “Patriotic Groups Planting Memorial Forests in Pisgah,” Waynesville Mountaineer, April 24, 1941. From the mid-nineteenth to the mid-twentieth century, lecturers often used glass lantern slides to illustrate their topics. Photographs were copied onto glass plates to make the slides, which would then be used with a projector to cast images onto walls or large screens. First developed in 1849, this process allowed for large groups of people to view photographs at the same time. This new technology was a no-brainer for lecturers. Large audiences now had a visual aid, one that was oftentimes further enhanced through color. Professional colorists hand-tinted the slides, producing colorized photos long before the invention of color film. Lantern slide depicting a stand of mixed hardwoods and softwoods, Cheat River watershed, West Virginia, 1923. FHS houses a set of such slides in the Duke University School of Forestry Lantern Slide Collection, a portion of which was recently digitized. These slides were collected by Clarence F. Korstian (1889–1968), a seminal figure in the history of forestry education both in North Carolina and nationwide. Korstian used the slides to accompany lectures during his tenure at Duke University from 1930 to 1959. Korstian standing in open stand of timber in Craven County, NC, 1927. Born and raised in Nebraska, Korstian spent the majority of his career in North Carolina. He served two decades with the U.S. Forest Service, about half of that at the Appalachian Forest Experiment Station in Asheville. He left the agency in 1930 to take a job at Duke as both a professor of silviculture and director of the Duke Forest. At Duke, Korstian organized a graduate school of forestry and served as the school’s first dean when it opened in the fall of 1938. He was instrumental in developing one of the nation’s leading forestry programs during his tenure, while also managing and expanding Duke Forest. Duke Forest vehicle traveling on bridge over New Hope Creek in Durham, NC, 1930s. The lantern slides Korstian collected to illustrate his forestry lectures come from at least 36 different states and several countries. Some of the photographs were taken by Korstian during his time with the Forest Service. The collection also includes photos from a trip he took to Europe to visit forestry schools in Germany, Switzerland, and France in the summer of 1932. The majority of slides in the collection are hand-colored, and as a whole they provide a unique look at forestry practices of the time as well as photographic technology. Dr. Hans Mayer-Wegelin, Forstassessor Petri, and Prof. Joshua Alban Cope on forest road in Bramwald Staatsoberforsterei. Hann-Munden, Germany, 1932. By the 1940s, 35mm Kodachrome slides began to take over as the preferred method for publicly showcasing photographs. Lantern slide use all but disappeared by the late 1950s. This was also around the same time that Korstian’s own career was winding down. He relinquished the deanship in 1957, and fully retired two years later. Following his retirement in 1959, one of the major divisions of Duke Forest was named in his honor. Over 100 of the 900 slides in the collection have so far been digitized and can now be accessed online via the FHS image database. You can view more selections from the collection below, and see the collection’s finding aid for additional information. To learn more about Korstian, read the oral history interview Clarence F. Korstian: Forty Years of Forestry conducted by Elwood Maunder in 1959. Second growth oaks, damaged at the base by fires. Pisgah National Forest, 1927. Steam skidder in a gum swamp, Dismal Swamp area, NC, 1922. Kudzu vines planted to control erosion, Tennessee, 1930. Chestnut trees at Greenwich Park, England. Virgin forest, chiefly spruce, at high elevation with rhododendron undergrowth, NC, 1900. In 1934, the Coweeta Experimental Forest was officially established on the Nantahala National Forest. Occupying nearly 4,000 acres just north of the North Carolina-Georgia border and renamed the Coweeta Hydrologic Laboratory in 1948, the site would prove to be the source of some of the most influential research on forested watersheds done in the world. This week a symposium to mark the 75th anniversary of Coweeta will look at the development of watershed science and celebrate the important research which continues to be done there. The story of Coweeta begins with Dr. Charles R. Hursh, who was hired in 1926 as a researcher at the Appalachian Forest Experiment Station (now the Southern Research Station) in Asheville, NC. Much of Hursh’s work was in streamflow and erosion studies, which led him to formulate broader theories of forests and water supply. Hursh identified the Coweeta Basin (in the Appalachian Mountains just south of Franklin, NC) as an ideal spot to locate a permanent research station to study the impacts of forest management practices on soil and water. Hursh was given access to the site and began informal research there, during which time an order establishing the Coweeta Experimental Forest was signed on June 1933 and then officially approved by Chief Ferdinand Silcox on March 28, 1934. Workers from the nearby Civilian Conservation Corps Camp in Franklin, NC (CCC Camp NC-23) built roads, buildings, testing stations, and other installations on the site. With limited resources and staffing, Hursh was still able to turn the site into an extensive hydrological laboratory and research station. Early studies looked at the effects of logging, farming, and woodland grazing on forest watersheds. Data gathered at the site was also used for important research in areas such as riparian vegetation and water supply; the properties of groundwater movement through soil; relationships between the atmosphere, environment, and forest watersheds; and the use of road banks for erosion control. Image of rain gauge recording instrument at Coweeta, from a 1953 USFS publication (click to view full page). The laboratory’s profile was further raised in 1955, when the Forest Service produced the film “The Waters of Coweeta” to increase nationwide awareness of the importance of watershed management and research. The arrival of researcher Wayne T. Swank at the laboratory in the 1960s ensured the continuation of Coweeta’s influential work. Swank spent more than 30 years at Coweeta, serving as project leader from 1984 to 1999, and helped to expand the successful research operations at the site. Cooperative work with the University of Georgia’s Institute of Ecology began in 1968, and produced an ongoing valuable partnership. Coweeta also became a National Science Foundation Long-Term Ecological Research site in 1980. More recent years have seen the work shift to new areas of study such as water quality research, acid rain, invasive pests, and prescribed fire. Through the years, Coweeta has maintained its importance as one of the oldest continuous environmental research studies in the world. The hydrologic research there has shown how forest ecosystems can be responsibly managed without ruining valuable water resources. Significant research in new areas ensures that Coweeta will remain as a center of forest research long into the future.